I love living in an all girls house… it means we can decorate in as many pink tones as we like! Admittedly, having a daughter is awesome as it means I can buy Mini Me all the toys that I wanted when I was a child. Namely a doll’s house and every possible piece of furniture possible. Wooden toys are so traditional and well made, that it would be criminal not to spoil Mini Me! We were asked to review Sophie’s Car by Le Toy Van and coordinating My Family dolls to be used in the car which have made great additions to our growing wooden toy collection. What do I personally love most about Sophie’s Car? The fact it is pink and decorated with white daisies ! Possibly the most awesome car ever! The Family of dolls fit perfectly into the car which is scaled to match the Le Toy Van dolls houses. However we must be lucky as the car does fit nicely with Mini Me’s current wooden doll’s house. Not that I think Mini Me would mind if the car was the same size as her house as she loves it so much! As you would expect from Le Toy Van range, Sophie’s car is very well made and very robust. Exactly why wooden toys are such a timeless item. The colours and decorations are beautiful and suitably girlie! The best feature of the car is the fact the trunk opens in which there is a suitcase and handbag… too cute! I did notice that the car does resemble a certain bubble like car that we can see on our roads everyday, which makes Sophie’s Car even cuter! With pastel yellow painted seats for the family to sit on, the mother is the driver. She knows which side her bread is buttered on! As you can see from the images, the coordinating Le Toy Van family (Mummy, Daddy, Little Boy, Little Girl) have a bit of a tight squeeze in the car. Mini Me knows she must only include 2 family members at most in the car ‘to ensure they are comfortable’ – though in reality it’s so that she can take them out easily. The family are very stylish indeed with lovely cheerful faces. The detailing is amazing! To the pigtails worn by the little girl, complete with bows to the jumper made from actual coordinating materials which the little boy wears. As far as a family doll set for a dolls house go, these are truly the best in my eyes. We absolutely love them and there really is little wonder why. The legs of the dolls are made from woven rope and are very strong but still pliable and sturdy. It’s due to the thick, woven rope that I know the dolls will last and there is no possible way they could be broken. 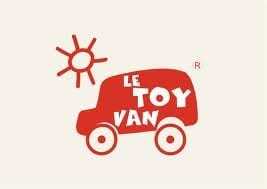 Le Toy Van products are designed in the UK, are ethically made from replenish-able wood and the educational benefits offered from the role play opportunities are endless. I am a huge fan of the range, Mini Me absolutely loves playing with Sophie’s Car and the Dolls and to hear her talking to them and having conversations whilst they are driving along is adorable. A perfect idea for Christmas! Can You Learn How To Ski Within 6 Hours At The Chill Factore?